well damn... all i was missing was ALT-Y. thanks! With the testing I have done I am able to hit a structure not much bigger than a tank. You need to have 3 things. 1. You need to be able to see the target in the F10 map so you can be sure you are picking the right impact point. Example, if you try and look at a Road Outpost structure it doesnt show on the map (you just see the target icon) and the icon isn't actually on the structure so you can't use it as an aim point. 2. You need to have two digits after the seconds decimal in order to get the accuracy you need. 3. You need to be around 20k'+ in alt. here lies the true issue. the game does not produce the final two decimal digits except for lasing correct? i saw an intensive video of a guy in a gazelle taking lasing info from a minimum of 3 vantage points to produce the decimal degrees. dont read this too early in the morning i guess best we can do is have a FACA but that misses the point. without data link between AC it boils down a bunch of unsquelched banter. now question is does ruining the runway eliminate the use by the enemy? DCS modeled that is. Just dropped $70, mig 19 (used some bonus) KA 50 and the GPS system. Oh course I will not be flying theses for a while as I am saturated..
Amen! Saturated is a good word for it. Flaming Cliffs 3 - F-5E - F/A-18C - MiG-15 - F-86F - A-10C - P-51D - A-4E-C - AV8B - MIG-19P - F-14D haha. not sure if this was answered yet. i was thinking about it and maybe the issue with accuracy was that the decimal degrees were not input? this can result in the coords being 100' off. wags video did the setup without the decimal degrees,, this help? hmm. i am going to create a new mission from scratch to see if i have any issue. i do not think the mission would matter. but at least i am doing other targets with other coords. i will let you know. hello top.. did you remember elevation? 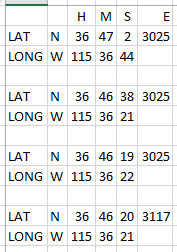 in my example on the nellis map the targets were 3025 / 3117 elevation. if this is not correct of course you will be way off. same idea as laser targeting. lasing to incorrect spot will cause bomb to miss. agreed. Wags vid was easy as pie. all i did was use my training mission and get coords from the targets. i made a litte Excel sheet or you can just put it on a piece of paper. Grim Reapers has a vid. cap used the mission editor to gather the coordinates of targets. he also just put waypoints on top of another set of targets. esetially in RL the target planners would use surveillance to get the co-ords. satellite or on ground sources. haha doh. nevermind. i guess you dont have your flux capacitor installed? have you tried it? it is meant for a minimal computer. i have gig internet and may try it. i have a older Windows 7 PC doing nothing. do you know what to do when the tech mod is added? i see instant action when you click on the icon. wondering if you add the targets in mission editor or something. i have seen content creators on youtube using this. DCS Series Flight Sims / Re: To curve or not to curve.